My first encounter with Maryann Lynch was also my first day moving into Boardwalk. She was dressed as if she were doing repair work along the lines of plumbing or painting, no business casual here, greeting me with a smile and welcoming me to her apartments. Maryann has made news as a preservationists and property owner many times. One incident that comes to mind is when a sign that has become sort of a local landmark was endanger of being lost she stepped in and offered to purchase it even though she had no idea where she would actually put it. That seems to be her mantra – “preserve first ask questions later”. No one would have recommended investing into the neighborhoods and structures she has, when she did, many were boarded up or in use for nefarious purposes. 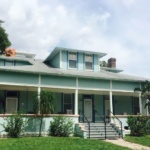 Her efforts though have been rewarded, once in 2008 when one of her most troublesome properties – Park Place was given honorable mention by St Pete Preservation. She was interviewed by the St Pete times in 2004 where information about her past career as a model was disclosed and we were told how she got her start in property management, buying her first property for less than $10k and then repairing and reselling it for a profit. That experience launched her into playing monopoly for real.